I’m celebrating this Independence Day by flushing the toilet. This is no commentary on the state of our country. It’s elation that my house is, at long last, connected to the city’s sewer. 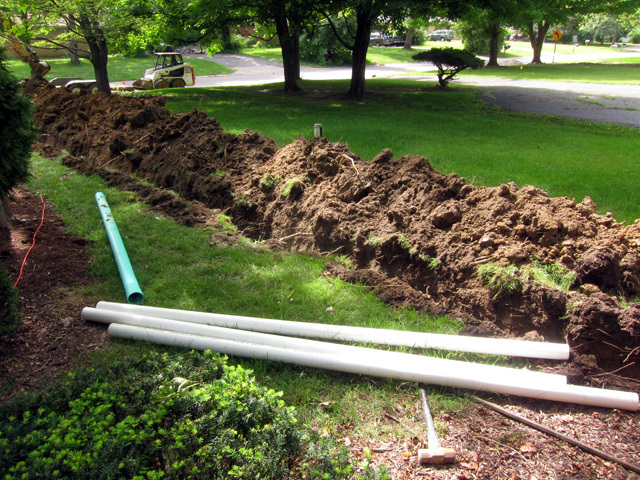 Longtime readers of this blog might remember that about four years ago the city sent me a letter that said they would lay sewer lines in my neighborhood and that I’d be required to connect at my cost. When my house was built, it was outside the Indianapolis city limits. So every home in my subdivision got a well and a septic system. But then in 1970 the city annexed the whole county. Time passed. The septic systems in the annexed subdivisions grew old. Some of them failed. Many of them leached into the ground water. So the city decided to extend sewer everywhere. It’s been an enormous project that has had streets torn up all over my part of town for years now. 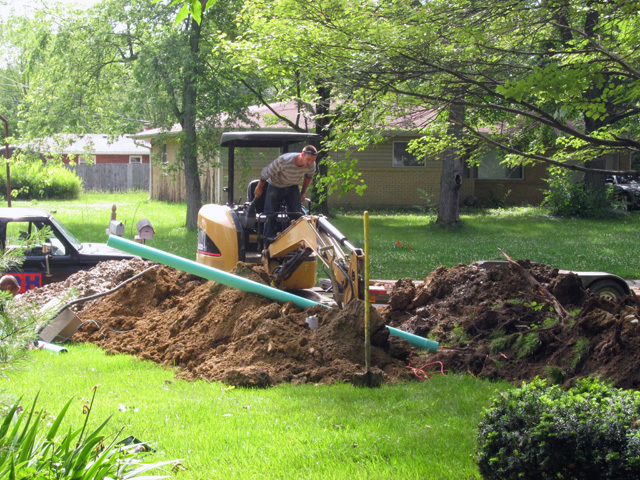 After I got over the initial cost shock, I realized that this would be dramatically less expensive than replacing my more-than-40-year-old septic system when it inevitably failed, which I figured would be sooner rather than later. I set aside the cash – and then it took two years for the city to lay the pipes in my neighborhood’s streets (photos here and here), and (unbelievably) another two years for the contractor I hired to get around to connecting me. They finished just the other day. 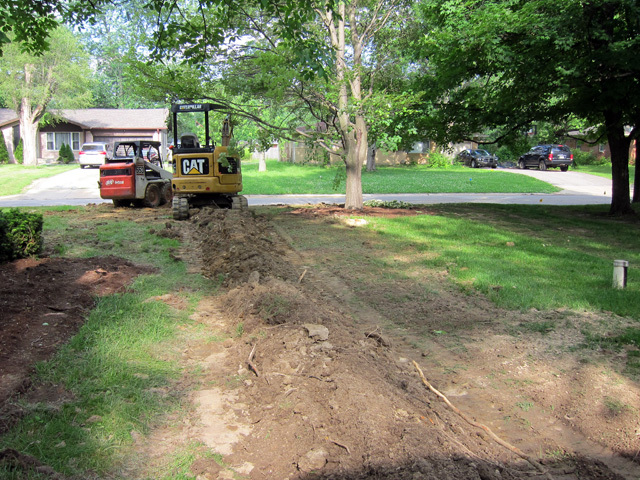 This was the scene in my front yard as the work commenced. I was not prepared for the shock of seeing my lawn destroyed, but obviously you can’t lay sewer lines without doing a lot of digging. 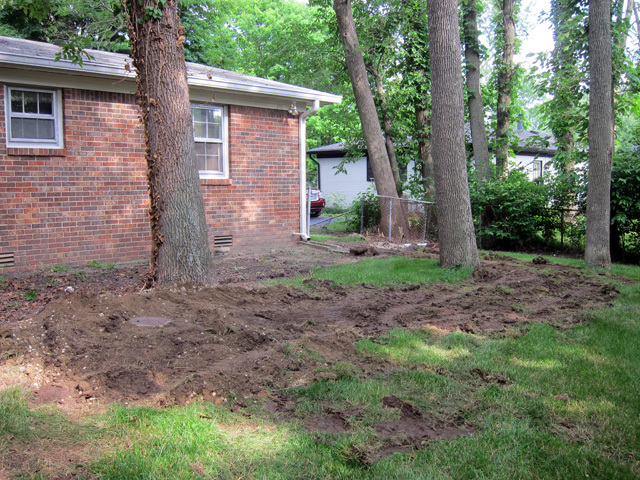 I was also not prepared for just how angry I would become when I discovered that their backhoe severed my well line. I was white-hot angry! Fortunately, they were able to repair the damage. Although the sewer line connected to my plumbing through the front of my house, the septic tank was out back, and part of the job included pumping the tank dry and filling it with dirt. The Bobcat they used to move the dirt tore up my grass pretty bad. After the line was laid and the city inspection had passed, they filled in the trench. And now I have a lot of landscaping to do. Yay. I’m relieved, not only that the job is done but especially that I’ve written the final check to pay for all of this. It’s really the relief of this not hanging over my head anymore. Because really, when I flush the toilet, I cant tell any difference! A quiet and relaxing 4th it will be. I had minor surgery last week and so I’m not fully up and about yet. Fun aside… wow, this sounds like the kind of thing people went through in the 1950s. You know, you’re doing something on your property, find out it once had a septic tank and a well, do some checking, and find out when it was that the city came along and did this thing. You know, back sometime when it was going to compromise your bomb shelter or something. Someday, this will be the “wow” moment for some family in, say, 2065. Except they’ll be able to see it in colour, and the whole thing won’t seem quite so remote from them in time as it does for us with B&W. I’m imagining some future owner starting to dig for a pool in the back yard and finding the finger system. Ick! Ugly. Simply ugly. But, it’s done. Lets hear an “Amen”. Clean-up & planting grass on your own schedule. Soon this will be a not-so-pretty memory. Happy Independence Day! Nice that the sewer is hooked up. It stinks that you have to do all that landscaping. True Independence Jim, what more could a man ask for !!!! Except for a monthly sewer bill that I never had to deal with before! At least it’s done–that had to be a relief. Oh, now you’ve gotten me started. Yes. I chose the company most of my neighbors chose. It turns out they are the most popular contractor by far. But it also turns out they have two (2) crews. So most of us have waited for a very long time. Their communication was terrible. I called them every two weeks to ask when they’d be coming out, and they always gave me an answer that was 2-8 weeks away. On Dec. 31, they even deposited a backhoe into my front yard with a promise they’d start the next day. The backhoe stayed for a week and then disappeared. Then one day they called and said they wanted to start the next day. Out of the blue. I was going to be out of town. The fellow seemed slightly put out! He even said I didn’t need to be home while they worked. I said that there was no way I was having anybody work on my yard and under my house while I wasn’t home. He called two more times over the next two weeks asking to start the next day, until finally he called on a day when I’d be home the next day. well, it all behind you now, lol. you may want to consider planting Hostas or other easily cared for perennials in place of some of the grass. I don’t know how you feel about lawns, but they are green deserts in terms of ecology and wildlife. on top of that, you can spend the hour or so of mowing time doing something more fun! we no longer have any lawn, it is all flower gardens or low growing groundcovers, and in the case of our backyard, it is all woodland shade garden. it doesn’t hurt that my wife is a horticulturist, though. Good luck! Out here in old suburbia, we have large yards. I have about a third of an acre. It would be an enormous job to replace it with alternatives to grass! My next-door neighbor has done just that, though. He’s a master hosta grower; every summer, tour buses stop here and people get out and admire his gardens. It’s a trip. Anyway, he has minimal grass to mow. Fortunately, I like to drive my tractor around my yard. It’s a peaceful time for me. Glad to see this ordeal is finally over, Jim! I know it’s been a conversation topic the past couple times we’ve met for drinks. And I feel like I keep seeing stories or mentions of broken pipes due to errant excavators. I think my eye is trained on that these days since I’ve been writing for a utility locator client of ours. This errant excavator also tore up a good chunk of the portion of my front yard that borders my neighbors’ when they connected that neighbor. Sooooo thrilled. But yes, now it’s just about landscaping and moving on – finally.